Brilliant colors; bright green leaves with yellow & red stems. Bright Red leaves; Mild corn flavor. Bright green heart shaped leaves; Spicy & nutty flavor. Mixture of Shisos, Mustards, Radish Ruby, Shungiku & More. Intense, green leaves; Amazingly aromatic, fresh basil flavor. Attractive, light green color. Amazingly fresh flavors of basil and citrus. Combination of 9 different Basils. Flavors of anise, cinnamon, clove, Italian, nutmeg, lemon and more. Beautiful purple color. Fresh basil and clove flavor. Wonderful for adding color to entrees and desserts. Colorful Red & green leaves. Great Beet flavor. Frilly green leaves; delicate and classy look. Yummy sweet & earthy carrot flavor goes with nearly any entree. Frilly green; Fresh celery flavor. Fantastic combination of 15-20 Greens and herbs. ; Topped by colorful edible flower petals. Needle-like, thin green leaves with tiny edible black seeds attached. Fresh chive/onion flavor. 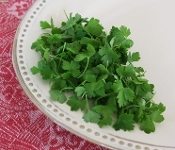 Shiny, thin, smooth green leaves; Intense cilantro flavor. Appealing combo of herbs & greens with different textures and a splash of red. Fresh flavors of lemon, lime, & tangerine. Thin, curly, small green leaves. Nice peppery spice. Thin & long frilly green leaves. Sweet & earthy licorice flavor. 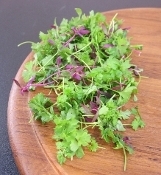 Classic French Herb Mix: Micros Chervil, Parsley, French Tarragon & Amaranth. Micro-sized lettuce combo of 8 different lettuces. Delicate, mild lettuce flavors. Green, red, purple leaves with different textures. Flavors range from citrusy to spicy to herbaceous. A mixture of a few different types of kale & cabbage. Super nutritious micro mix! Earthy & slightly bitter taste. A colorful combination of all of our Red colored Microgreens. Deep green leaves. Strong, fresh taste of spearmint. Perfect garnish and flavor addition to all kinds of desserts. Our Mirepoix Mix is a microgreen version of the classic carrot, onion & celery combination. Bright green colors. Attractive micro with light green leaves and a snappy personality. Tastes like spicy Mustard! Dark green and maroon leaves with a strong mustard taste. Tiny and beautiful flat leafed parsley. Fresh parsley flavor and fragrance. Lovely, round green leaves with a fresh Spring pea taste. Royal dark purple leaves on matching purple colored stems. Fresh and spicy radish flavor accents seafood and meat entrees. Thin, succulent dark green leaves. has a mild salty, juicy flavor. Wonderful accompaniment to seafood! Delicate and attractive dark reddish-green leaves. Subtle shiso flavor. Beautiful garnish for sushi! Beautiful feathery green leaves. Amazing and surprising tangerine flavor! 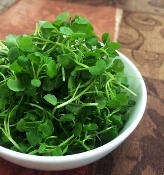 Rich, green, shiny circular leaves; Perfect for seafood dishes.